See her exhibitions list here. Working in her 1600 square foot studio, Murphy takes green medias such as recycled steel, recycled fiberclay, aerated cement and nature and creates her own elemental organic forms and ecologically sound, abstract interpretations. Using her original patina formulas, including a steel skin and fiberclay cement, her creations are one of a kind that speaks to the value of one individual’s contribution through personal exploration. Murphy’s sculptures have been shown nationally in such places as the Maryhill Museum, the Coos Bay Art Museum and the Contemporary Craft Museum in Oregon, New Mexico Gallery in Santa Fe, New Mexico, The Robert Paul Gallery in Burlington, Vermont, KGB Gallery in Scottsdale, Arizona and can presently be seen in The Lawrence Gallery in McMinneville and Riversea in Astoria, OR, along with the Peterson/Roth Gallery in Bend, OR and Brueton LA in Los Angeles, CA. Publications include the cover of the Sculpture Journal. 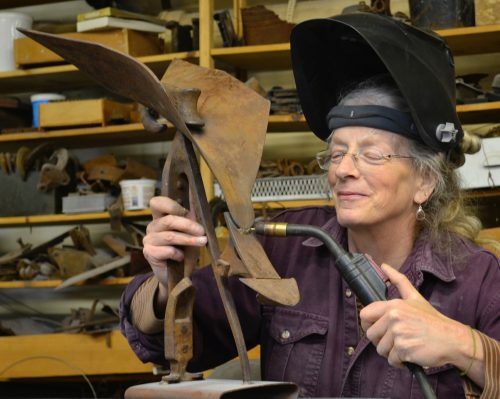 She has held such positions as the president of the Pacific Northwest Sculptors for a number of years and is still drawn to teach sculpture and art welding in her private classroom.